Posted September 26, 2017 by CultBox Editor & filed under Episode guides, Features, Headlines. Star Trek is back on our screens thanks to CBS and Netflix! Here is our guide to the 15-episode series Star Trek Discovery. With new episodes of Star Trek Discovery premiering every Sunday on CBS All Access in the US, and the following Monday on the global streaming service, you won’t be able to binge the new Star Trek just yet. No matter, though, you can check back here every week for any trailers and news on upcoming episodes, as well as to find links for all our previous reviews and related news stories. These links can transport you directly to the following coordinates. “Star Trek Discovery will follow the voyages of Starfleet on their missions to discover new worlds and new lifeforms, and one Starfleet officer who must learn that to truly understand all things alien, you must first understand yourself. In the run-up to Discovery’s launch, we were offered a series of trailers hinting at what the season would offer-up. Here they are. Available: Sep 24th, 2017 (CBS All Access), Sep 25th, 2017 (Netflix). Summary: While investigating a damaged relay beacon at the edge of Federation space, the crew of the USS Shenzhou encounter an anomaly that is far more than initially meets the eye. A subsequent encounter with a seemingly radical Klingon faction leads to a situation that could quickly escalate to all-out war. Convinced Star Fleet is adopting the wrong tactics, first officer Michael Burnham takes radical action that has dire consequences for her. Summary: As the stand-off between Star Fleet and the resurgent Klingons comes to a head, onboard the Shenzhou Burnham escapes her cell and convinces Captain Georgiou to undertake a risky mission to capture the Klingon zealot T’Kuvma. When things go wrong, it sets in motion a chain of events that makes ongoing conflict inevitable, and sees Burnham pay for her insubordination with a life sentence. Available: Oct 1st, 2017 (CBS All Access), Oct 2nd, 2017 (Netflix). Preview: After the prologue-style opening double bill, expect a shift in focus for Discovery as we finally encounter the titular ship with Jason Isaac’s Cpt. 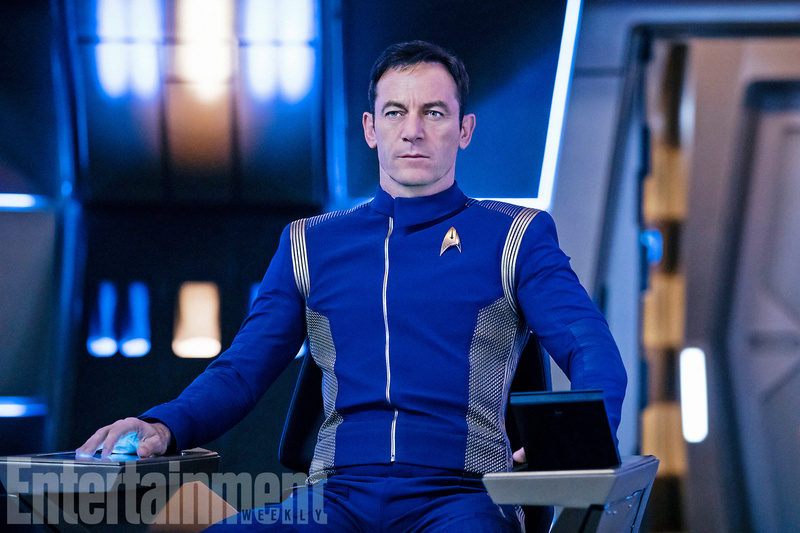 Lorca running the bridge. CBS All Access has now put a trailer up showing us that a fair bit of water will have gone under the bridge between episode 2 and 3. Here it is. We broke down what it shows in our detailed analysis. Here is a gallery of images from the episode. Available: Oct 8th, 2017 (CBS All Access), Oct 9th, 2017 (Netflix). Here is our breakdown of the trailer for the episode. Available: Oct 15th, 2017 (CBS All Access), Oct 16th, 2017 (Netflix). Here is a spoiler-filled review of Choose Your Pain. Available: Oct 22nd, 2017 (CBS All Access), Oct 23rd, 2017 (Netflix). Here is a spoiler-filled review of the episode. After this episode it was confirmed that Star Trek Discovery has been renewed for a second season. Available: Oct 29th, 2017 (CBS All Access), Oct 30th, 2017 (Netflix). Here is our breakdown of the 30-second trailer. Available: Nov 5th, 2017 (CBS All Access), Nov 6th, 2017 (Netflix). Available: Nov 12th, 2017 (CBS All Access), Nov 13th, 2017 (Netflix).